This communique comes from the National Indigenous Congress and the Indigenous Government Council denouncing the harassment of Indigenous communities that have refused to allow the electoral process take place in their territories. This includes military helicopter flyers in Zapatista territory, misinformation being spread in the corporate media, and threats of repression in Indigenous communities of Michoacán and Jalisco. Originally published by It’s Going Down. The Indigenous Government Council and the National Indigenous Congress denounce and condemn the harassment on part of the bad government with military helicopter flyers in the territory of the bases of support of the EZLN in the Lacandona Jungle, in the state of Chiapas. We denounce this cowardly aggression that adds to the diffusion of false information spread this past June 26th by the corporate media. There they published images of supposed “representatives of 23 Rebel Autonomous Zapatista Municipalities (MAREZ)” endorsing the candidacy of the cacique Roberto Albores, PRI candidate to govern Chiapas. In a deceptive manner, the political class used masked up people posing as representatives of MAREZ, through an organization called the Regional Union of Marginalized Ejidos in the State (UREME). 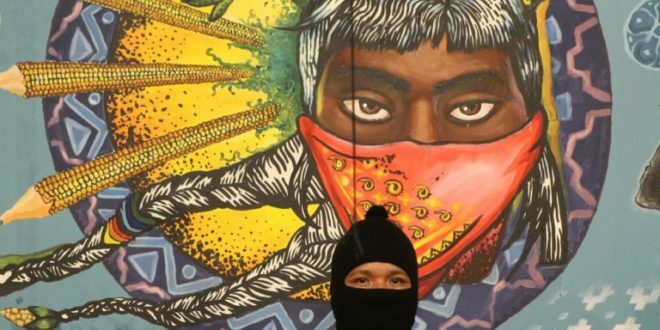 We clarify that this organization UREME is not and has never been part of the National Indigenous Congress, nor are they representatives of the Zapatista Caracoles. Thus, we do not know any assertion or political position that they might have regarding the party of the powerful which is the capitalist electoral process. The CNI and the bases of support of the EZLN have made our thoughts clear without rest, that capitalist politics do not fit with ours. We do not support any political party or candidate because our struggle is for life and not for the rotten power of the bad governments, for the destruction of those below and of Mother Earth. In that same sense, we energetically condemn the aggressions of the bad government with the intention of installing voting booths for the elections on July 1st in the Indigenous municipalities and communities that have decided to expel political parties and the electoral processes from their territories. This is the case of Tila, Chiapas and Nahuatzen in the Purépecha plateau of Michoacán. We denounce the militarization of entire regions of the country with the pretext of safeguarding the electoral process. We demand respect for the decision of the Wixárika community of San Sebastián Teponahuaxtlan, in Jalisco, of not allowing the electoral process in their territory. We reject the lies and the war with which they seek to divide our peoples. For us the true importance is the struggle for life, and not the death that the bad governments bring and will bring, regardless of their political party.